Two Albanians who ran cannabis factories in Peterborough will be deported after police seized plants worth tens of thousands of pounds. Sokol Sakuta and Kledian Lezaj were employed as gardeners at the two farms when officers carried out raids across the city to tackle the production of drugs in Peterborough. 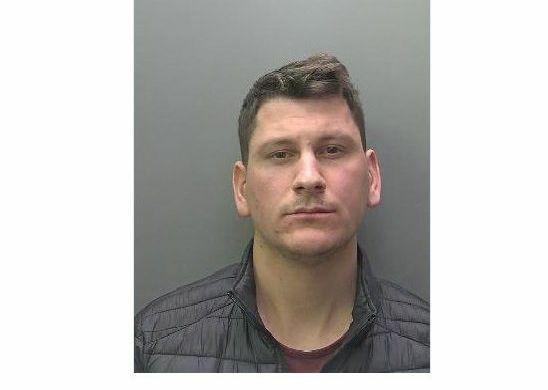 Lezaj tried to run from the house in Swanspool, Peterborough wearing just a pair of shorts but was captured by police officers as they executed warrants on February 1. Sakuta, meanwhile, was arrested at a house in Drayton in Peterborough on the same day. Today they both appeared at Peterborough Crown Court, where they were jailed after admitting being concerned in the production of cannabis. Lezaj was jailed for eight months, while Sakuta was locked up for 20 months by Judge Sean Enright. Both men - in the UK illegally - will be deported at the end of their jail term. The court was told there was no connection between the cases. James Earle, prosecuting, said at the property in Swanspool police found a total of 61 plants, with a potential value of between £17,000 and £51,000. Mr Earle said Lezaj (27) had arrived in the UK six months ago in the back of a lorry. After working in London as a labourer, he came to Peterborough. Mr Earle said: “He was met at the railway station by an Albanian man and a Pakistani man. They offered him work at a cannabis factory, where he would be given a room for free and £50 a week for food to look after the plants, with the promise of more money when the drugs were harvested.” More drugs were found at the Drayton address, with 113 plants found in two rooms, along with bag filled with cannabis in the kitchen. The court was told the plants had a potential value of between £31,640 and £94,920, while the drugs in the bags had a value of around £50,000. Mr Earle said Sakuta (23) had been in the country longer than Lezaj - and initially tried to give a false name and date of birth - but police found his Albanian photo ID card in the house. Mr Earle said Sakuta was also more involved in setting up the factory. John Farmer, defending for both men, said both had been exploited, and had found themselves in a ‘hopeless’ situation. He added that both had pleaded guilty at the first opportunity, and neither had any serious convictions. He said both men would be deported - and would have to ‘face the music’ when they got home, when they explained they were unable to pay the large debts they had built up travelling to the UK. The court heard all the drugs and paraphernalia used to set up the factories would be destroyed. The raids happened on a day of action by police, where a number of cannabis factories were dismantled.